CNRS and the japanese university « Nara Institute of Science and Technology » (NAIST) have decided to commit themselves in a partnership which has been signed on the 27th of October, 2014. This research agreement open the way to the setting of a NAIST satellite at the CEMES-CNRS where a franco-japanese team will develop new molecules with the goal to trigger controlled movements on a surface via cascade electron transfers. 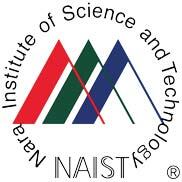 NAIST, a japanese university of excellence, specialized in sciences, has been selected by the japanese governement as one of the 22 research universities in Japan (among about 500 universities). In this respect, an important complementary budget entrusted to increase its research capacity through internationalization of its teaching and its research. In this context, it was decided to establish a research satellite of NAIST in CEMES. The implementation of this joint laboratory between NAIST and CEMES follows a strong relationship built up over the years between NAIST and Université Paul Sabatier. In 2008 was signed a student exchange program at the Master's and Doctorate level (resp. Prof. Gwénael Rapenne). In this context, an average of three French students and three Japanese students are exchanged for internships lab of 2 to 6 months since 2008. In 2013, the agreement was signed increasing the capacity in both directions from 3 to 5 and extending to all scientific fields. On the basis of this very active exchange program which is enjoyed by both institutions, NAIST has proposed to set up a double degree program at the doctoral level between NAIST and UPS which was finalized in April 2014. The first students are expected to be enroled in April 2015 for the first Japanese student and in September 2015 for the first french student. Therefore, the establishment of a joint research structure was considered, negotiated and signed October 27, 2014 by Mr. Patrick Mounaud, the CNRS regional representative and Prof. Naotake Ogasawara the President of NAIST in presence of Dr Alain Claverie, Director of CEMES, Prof. Gwénaël Rapenne (responsible of the satellite in CEMES), Prof. Tsuyoshi Kawai (responsible of the satellite in NAIST) and Dr François Demangeot, Vice President of the Université Paul Sabatier.